Dirk Giles, the incident commander in training for the Alatna Complex, talks to Alatna and Allakaket villagers at a community meeting at the Allakaket Tribal Council Hall on June 30, 2016. (ALLAKAKET, Alaska) – Alatna Complex fire officials held the first community meeting in Allakaket today to talk about the BLM Alaska Fire Service’s strategy to handle fires burning on the west side of the Koyukuk River. 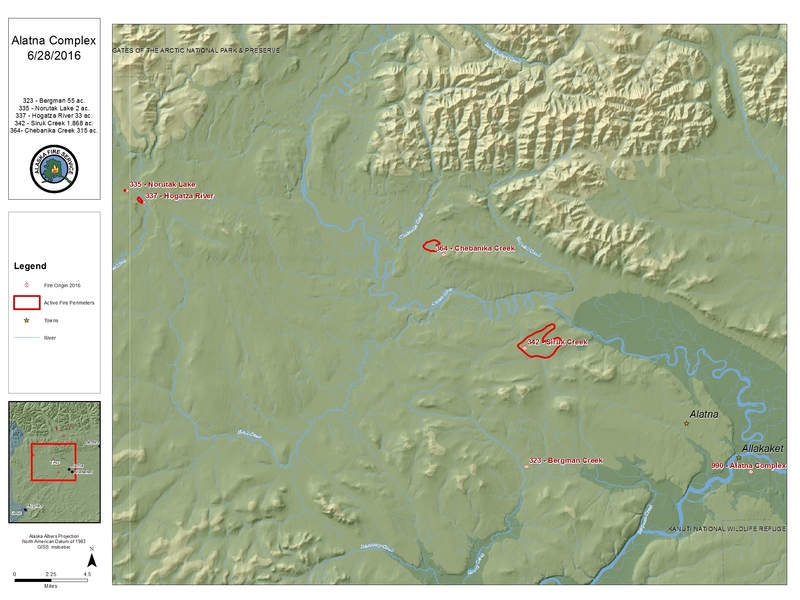 The Alatna Complex is comprised of five fires that are located to the north and west of Allakaket and Alatna. The complex transitioned to a Type 3 incident command organization on June 29 with Incident Commander (IC) Adam Kohley and Dirk Giles as the IC trainee. The incident command post (ICP) was set up at the school in Allakaket. There are currently 101 personnel assigned to the complex with additional overhead arriving today and tomorrow. Approximately 25 residents of Allakaket and Alatna were in attendence at the community meeting that was held at 2 p.m. in the Allakaket Tribal Council hall. On Wednesday, the fires saw low to moderate fire behavior due to higher relative humidities in the area. The weather for today and tomorrow is forecasted to be warmer and drier with some thunderstorms that could be accompanied by variable winds. The Siruk Creek Fire (#342) has grown to 1,832 acres and is located on state land in a modified protection area. The Chena Interagency Hotshot Crew and Chugachmuit’s Yukon Type 2 Initial Attack crew are assigned to the fire. As long as the weather and fire behavior permits, fire personnel plan to use a direct attack strategy utilizing natural barriers where possible to protect sites of values in the area. The Bergman Creek Fire (#323) remains at 55 acres on Doyon Limited land in a modified protection area. There are 47 Type 2 Emergency Firefighter crew members from Allakaket and Hughes currently gridding the fire perimeter for hot spots and mopping up any areas of concern. The remaining three fires, the Chebanika Creek Fire (#364) is 770 acres, Hogatza River Fire (#337) is 224 acres, and Norutak Lake Fire (#335) is two acres in size. All are being evaluated and monitored daily by incident personnel for fire behavior and growth. Appropriate actions will be taken if fire officials deem it neccesary on any of the monitored fires. The most up to date information and maps of the Alatna Complex Fires will be available online at www.akfireinfo.com and will be posted in Allakaket at the tribal council building and the Allakaket school. Updates and maps will also be distributed via email to those that request to be added to our email distribution list. Send an email to Alatna.complex.icp@gmail.com requesting to be added or leave your address on the community meeting sign-in sheet. For information about the Alatna Complex, contact Public Information Officer Celeste Prescott at (907)968-2205 or by emailing Alatna.complex.icp@gmail.com. For more information on fires statewide visit www.akfireinfo.com or call the Alaska Interagency Information Center fire information line at (907)356-5511. In addition, you can follow BLM Alaska Fire Service on Facebook or Twitter. A June 30, 2016 BLM Alaska Fire Service map of the Alatna Complex, which includes five fires burning north and west of Allakaket and Alatna.